Dog owners are often curious whether there really is such a thing as best chew proof dog bed or chew resistant dog bed for dogs that chew a lot, and that cannot be destroyed. “My dog chews through anything!” True – even some of the oft-marketed best indestructible dog bed options will not sustain very strong chewers, particularly large breeds. But are there any actually chew proof dog beds that will? Are there any chew proof dog beds for large dog breeds (as well as small and medium dogs)? 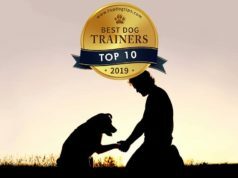 Below is a huge review, analysis and rankings of the most indestructible dog beds that can actually be labeled as the best chew proof dog bed products. How these best chew proof dog beds were rated? Research has shown us that it's actually common for dogs to chew on everything. Beds aren't the only exclusive piece of furniture. Therefore, it's simply smart to consider all types of the best indestructible dog bed options for our pets to avoid getting… angry. 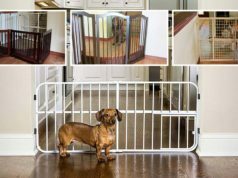 When doing the research to find the actually the best chew proof dog beds that will sustain most of the damage done by dogs for my obnoxious chewer, I considered several factors to draw a more accurate conclusion for this best indestructible dog bed list to make sure the top rated options fit the criteria. Our team here tested the many chew proof beds for dogs (and we've included reviews and some videos in this article for you to peruse), and then it was time to rank them and compare them together. First, we created a list of “goals” that all these best chew resistant dog beds need to “accomplish.” Second, for the actual assessment, I took it upon myself and went asking pet owners what they thought was the best indestructible dog bed and have they tested it, researching company's reputation and the bed's rank, took a look at what pet owners said about each one of our picked best chew proof dog bed brands (and I provide those below), considered other chew resistant dog bed reviews, and of course factored in how these best indestructible dog beds were made and using what materials. What you see in this list of best chew resistant dog beds is what we all came up with through our many hours of research. I encourage you to read those chew proof dog bed reviews from other owners so you get a better idea of what it's about, and also do your own due diligence before buying. Finding the best indestructible dog bed for your specific canine may still be a difficult matter, even though some chew proof dog beds are clearly ranking higher. Every Fido is different, so do some of your own research too. And the best of both worlds: a dog bed with high level of comfort, chew proof, a little pillow-like but actually looks and feels like a dog bed (like that from Orvis), with the only problem – its price. Ultimately, I would say to take this list as a point of reference, but in terms of which is the best chew resistant dog bed specifically for you and your dog will depend on what you're looking out of the bed and what kind of dog you have. All of these are rated as highly chew proof dog beds, but some with more comfort and design and others with less of that. Consider pros and cons of each, but I do provide our opinions as well as opinions of other pet owners. Are there any benefits of using dog beds? This is one of the main questions I've had back in the day before I purchased by first dog bed. Today, we have some good quality information to answer this question. Going through my research for the best indestructible dog bed, this gave me a chance to refresh some of the knowledge on the benefits, but I recommend listening to Theory of Pets podcast with one of Top Dog Tips editor Samantha as the host. TOP 004 Episode: Benefits of Using Dog Beds with Dr Sarah Wooten and Eric Shannon. The three of them – Samantha (expert on dog products), Dr Wooten (a veterinarian) and Eric (pet industry expert on dog beds) – discuss everything about dog beds, pros and cons, health benefits, dangers of certain beds and more. If you're looking at this page, then I probably don't need to tell you why you should consider finding the best chew resistant dog beds for your pets. You already know. But just in case you're still on the fence, here's at least on reason from my personal experience on why I decided to switch my dog to a chew proof dog bed: I couldn't afford to be buying new dog beds. Again, studies have shown that dogs are supposed to chew. It's not a bad habit or some misbehavior – it's just the way dogs act, this is in their nature. And the reality is that our canines have been known to break their way through things like Kevlar, bricks, wood, chain link fences, and even certain metals (shown in studies). If your dog is an in-born chewer, there's nothing you can do to stop him other than getting the best indestructible dog bed. And depending how badly your dog wants to chew through some furniture, he will find a way to destruct even the most “indestructible” things. To a certain level, at least these five best chew resistant dog beds that are chew-proof can protect themselves from your Fido's teeth, which has been tried and tested by many pet owners. The reason those indestructible dog beds are able to accomplish that is because they have been made using the best chew-proof technology and materials. Sometimes, that requires sacrificing comfort levels of the bed. Before you buy any indestructible dog beds, always consider the company's reputation. This is important because if you buy one of these best chew resistant dog beds, you need guarantees that it will work with your pet. If not, you should get a refund. That's why I do two things with my rankings: (1) list only companies that work directly with Amazon, because Amazon has the best return policy and they are always, always on the side of the customer (they truly care about staying the most customer-centric company in America); (2) emphasize the importance for you to take a look at the reviews of other pet owners to see what they think about the company (not just the bed itself). The Big Barker 7-inch orthopedic dog bed has taken the market by storm when a family-run business have first released their handcrafted products. Now almost a decade later, the company still remains the most customer-centric dog supplies manufacturer with the highest quality dog beds bar none. This can be easily confirmed by reading thousands of chew proof dog bed reviews from customers who've tried and tested the Big Barker bed, as well as the company's belief in their product – 10 year money back guarantee, no questions asks. Naturally, we had to get this bed and test it ourselves. When a product is labeled as the best indestructible dog bed out there, you'd expect this to be something different from the many other beds you've tried before (that your dog has destroyed and chewed through). The Big Barker surely is: it comes in many different sizes to fit literally any dog out there, with their Giant size being able to fit two (!) large breeds dogs on just one bed. You can see just the “regular” large size in our video and how Samantha comfortable fits on it herself. Due to the handcrafting process of manufacturing this best indestructible dog bed, the results is a bed that will sustain chewing far better than most other best chew proof dog bed brands out there of similar type. The only one that could beat the Big Barker in terms of indestructibility is a much less comfortable metal dog bed from Kuranda, but it also comes with a lot of its own disadvantages. In terms of “the best of both worlds,” the Big Barker is the actual best indestructible dog bed for large dogs, medium dogs and even giant breeds that will not only sustain chewing but is also comfortable and healthy for the canine. After testing this famous best indestructible dog bed, we were genuinely surprised that all the marketing claims actually hold true. Just to be sure, we've also scoured thousands of chew proof dog bed reviews to see what other pet owners are saying, and the customers were satisfied the most with the Big Barker. The sheer level of customer satisfaction is why we also decided to rank this as the first best chew proof dog bed brand. Customers with older dogs (such as one woman with an 11-year-old Lab) were pleased at the quality of the foam and how it cushioned their dogs’ sensitive bones and muscles. Surveying for more feedback, we found that people reporting back after an extended period of time also commented on not only this being their favorite best indestructible bed after the many they've tried, but also how well the bed kept its shape—guess the ten year guarantee works after all! The key to an actually high quality chew proof dog bed is the quality of cover used and the foam underneath it, as well as the way the bed is put together. In this case, it's manufactured by people (rather than factory) with years of experience in this area. Take a close at more chew proof dog bed reviews and watch ours as well. One of the best chew resistant dog beds that is also very affordable – Kuranda Walnut PVC Chewproof Dog Beds. This pet bed sits strongly on my list as the second best choice. Why is it second? 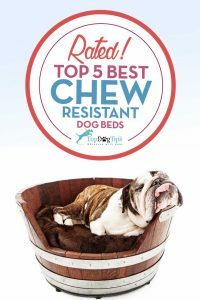 Even though the bed itself is probably the best chew proof dog bed to ever exist (and also the cheapest one on this list!) it does sacrifice comfort and design for that. So if the style of your dog's bed is important to you, as well as how comfortable your dog will be, then you may want to consider the above mentioned best indestructible dog bed from Big Barker. Don't get me wrong. It's still a comfortable dog bed for most pets, and many pet owners in their reviews (link below) have also mentioned no issues with that. It's just not as stylish or comfy as other options on this list of best chew resistant dogs. In terms of chew resistance, Kuranda is by far the most indestructible dog bed there is because of its simplistic metal design. Kuranda chewproof dog beds come with a very strong PVC metal frame that will support any dog up to 130 lbs, so these are great dog beds for large dogs. To keep your canine warm or cool, as well as dry at all times, the bed's design is elevated and raised, which is another huge plus. It's extremely simple to clean (as there's not that much to clean in the first place!) and its ballistic nylon will make sure to withstand any type of damage your dog can unleash on this chew proof bed for dogs. Third one on this list of best chewproof dog beds is something from the famous K9 Ballistics. This company has been in the business of manufacturing beds for dogs for years now. They are also one of the first to create a truly best indestructible dog bed (which has been beaten to the first place since then, but still). K9 Ballistics' orthopedic dog bed is resistant to heavy/moderate chewers and combines certain features from the two pet beds mentioned above. It's a great looking, stylish, comfortable and durable dog bed that looks good at home. K9 Ballistics doggy beds also have a thick medicinal-grade levels of foam, including supportive high density dog bed foam and the layer of same high density memory foam. 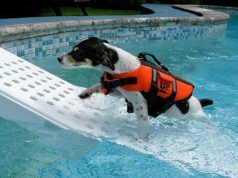 It has completely waterproof outer and inner dog bed covers that will prevent any accidents from taking place on the actual foam. Of course it's also water-, dirt-, tears-, odor-, hair-, stains-resistant. Great choice as an affordable, orthopedic, indestructible chew-proof bed for dogs, but the quality seems to have been declining recently. This chewproof dog bed is also made by the same company, Orvis, who currently owns the fourth position on my list of best chew resistant dog beds. I also have to mention that it can be interchangeable with the bed in the fifth position, according to what I've researched online. Both Orvis Toughchew and K9 Ballistics are decent dog beds for chewers. They aren't the most chew-proof on the list, nor did they receive the best ratings from other pet owners and reviewers. However, they're also cheaper than both of these companies' more expensive options, list at first and third position. Either way, this chew-proof bed for dogs from Orvis is designed for semi heavy duty chewers. It's big, comfortable, high quality and tough. The cover is removable, and you can always wash it in the machine. Again, remember to read this chewproof dog bed reviews from other pet owners before deciding on anything. This fifth best indestructible dog bed is good for pet owners on a budget who have chewers of medium breeds and some medium-large breeds, but it won't sustain the most hard chewers. Next to last one on my list of best chew resistant dog beds is another decent option from K9 Ballistics. The company is one of the most popular US manufacturers of chew-proof dog beds with great reputation, and this K9 Ballistics Round TUFF bed for dogs has also gained a positive feedback from owners. While not as strong as the many other best indestructible dog beds above and designed primarily for light to moderate chewing dogs, it's more stylish and better looking within your home decor, let alone being more comfortable for your pooch. The bed itself is resistant to most things: dirt, water, odor, tears, hair, etc. The seams on the bed are double-stitched to provide extra strength, and the ballistic fibers make it a more durable and indestructible dog bed that will last for longer. If you're looking for a bed from K9 Ballistics that's more aimed towards heavy chewers, I suggest trying the bed mentioned above (however, it's more expensive). K9 Ballistics are known for manufacturing some of the best indestructible dog bed options, but some of their products have recently declined in quality, as sad as I find this to say. As the final best chew resistant dog bed, we've came upon to pick Orvis' Toughchew bed. I'm not the only one, with many other pet owners and review websites saying the same thing: it's both a comfortable and indestructible dog bed (for medium chewers), but it's far from being the best indestructible dog bed due to the design. It's obviously not as chew resistant as Kuranda listed below, but then again, nothing can be more resistant than their “military grade” bed. Orvis' best indestructible pet bed comes with polyester fill and is best for dogs up to 60 lbs. So if you have a medium sized strong chewer, this could be one of the best chew resistant dog beds for both of you. Unfortunately, if you have a huge Fido, Orvis do not manufacture pet beds for large dogs, which is sad. In fact, the only decent dog bed for large dogs that I found is Big Barker bed. The major drawback of this chewproof dog bed is its price. At $300, it requires serious consideration before you jump the gun. Especially when you consider that Kuranda's dog bed (listed below) only costs just a little above $100. Of course, you pay for company's stellar reputation, bed's comfort and design, which is easily the best one out of the five beds on this list. Finally, Orvis Toughchew fourth best indestructible dog bed also comes only in one size and one color. It's not a bad color and the size is perfect for most dogs, because the company picked a sweet spot there. However, it still won't fit all breeds and sizes of dogs. Nevertheless, I recommend you do more due diligence on this indestructible dog bed, because its cost begs for that. How are the best chew resistant dog beds built? Surprisingly, not all dog furniture and dog beds are the same. Certain chew-proof beds for dogs are built to hinder canine's ability to actually chew through the material. For example, some chew-resistant dog beds manufacturers are using dog bed covers made out of military-grade nylon known as 1680 denier ballistic type. All of this makes finding the best indestructible dog bed that will actually handle your dog's chewing a bit difficult. The above mentioned material is often used for body armor in the US military. Obviously, such type of material will be harder to chew through that your regular cheaper cloths used in normal, more pretty, cute and cool dog beds. This is what the best chew proof dog beds are often made of, but because of its expensive price tag, it's hard to find them. Other examples of materials used in best chew resistant dog beds are same ones as used in military flak jackets, sometimes called as ballistic fabric. A lot of chew-proof dog beds dropped using zippers in exchange for ultra-strong velcro closures which they place somewhere hidden (usually underneath) to prevent the dog from reaching them too easily. These best chew resistant dog beds are also great for outdoors as they can survive pretty much anything. Covers are completely water-resistant and have UV protection as well. No scratches, tears, scrapes or anything can take down these indestructible dog beds. 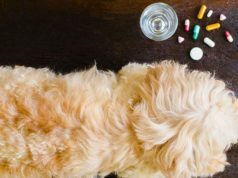 Finally, another solution to preventing chewing of dog beds are sprays like Bitter Apple for Dogs Spray. This anti-chew spray will make the dog bed unpleasant for your pooch to chew on. Do not purchase the K-9 Ballistic if you heavy heavy chewers. My dogs both weigh 55 pounds and they had them torn apart with the contents strewn everywhere within 10-15 minutes.